Home / Outdoors / Events / All About Bees! 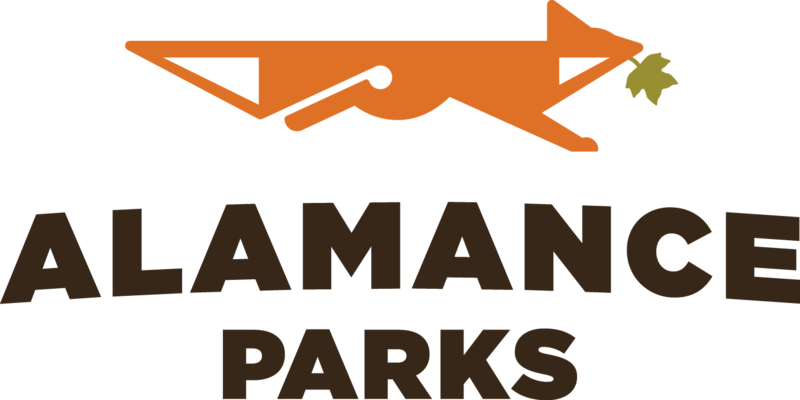 The Alamance Beekeepers Association offers an introductory beekeeping course in the winter…if you’re interested stay tuned to their website, Ira will be posting the course information soon (alamancebeekeepers.org). 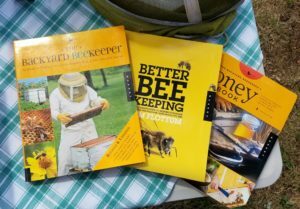 These are several books the presenters brought and recommend for new beekeepers. Some of these titles are available at the library. If you want to get into beekeeping, Ira and Paul encourage you to start by taking an introductory course and reading as many resources as you can. They also caution that during your first year, your major goal is just to keep the bees alive! It can take a few years to really get into the swing of things and get good honey production. The public library has a great selection of books on beekeeping. Check with your local librarian for some great titles. Ira and Paul recommend The Backyard Beekeeper for getting started, and ABC & XYZ of Bee Culture for a reference text. Paul showed us what the hive frames look like when wax moths get into them. These pests tend to trouble weaker hives and are very destructive. If you start keeping bees you can expect to contend with several major pests. The Varroa mite is the most significant pest. The mite feeds on the bees and can spread viruses that cause further harm. Other pests include hive beetles and wax moths. In the photo, you can see the damage a wax moth can cause to a weaker hive- they consume the wax combs. There are natural treatment methods for these pests that do not require the use of harmful pesticides. Another problem facing bees in the U.S. is the Africanization of honeybees. African honeybees are more aggressive than western honeybees. They have become introduced into a number of bee populations via escaped African honeybee swarms and subsequent interbreeding. NC has an aggressive program to prevent Africanization of its honeybees. The African honeybee and hybrid offspring are known for their aggression and will sting much more readily than western honeybees. 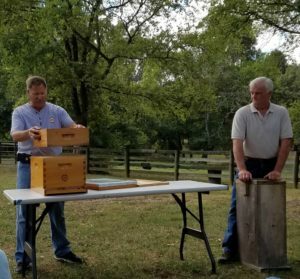 On the left, Ira demonstrates the components of a modern bee box. The main box has a a bottom landing entry for the bees and a honey super that goes on the top. Inside are the frames. On the right Paul is holding an antique plank style bee gum. The historic way to keep bees was in bee gums. In their earliest form, this was just a chunk of black gum tree housing a hive that people removed from the tree, set on a flat rock, and laid a board on top of. Then they started making their own bee gums out of black gum wood. These older style plank hives were less efficient than modern hive boxes and often resulted in harm to the bees. Modern style hive boxes were introduced in the mid-1800s. For comparison, a plank hive might yield 5-6 lbs of honey while the modern box with frames would yield around 25 lbs and be reusable. However, a lot of folks couldn’t afford the modern boxes and frames, so the plank gums persisted longer in certain areas- including Appalachia. You can learn more about old beekeeping methods in the 2nd edition of the Foxfire books. Currently, the modern boxes with frames are the only legal way to keep bees. The box holds 8 to 10 frames, has a landing platform for entry, and a honey super that goes on top during honey production season. A 10-frame box with a full hive and good honey production can weigh around 95 lbs! Local honey and Sourwood honey produced by the presenters shared the table with packets of bee friendly flower seeds. Honey can’t go bad unless you get water in it. If water gets in, it will ferment. However, over time even properly cared for honey will crystallize- but it’s still perfectly safe to enjoy. When buying honey, make sure you understand the labeling requirements so you understand what you’re paying for. As long as the honey has been laboratory tested and is composed of at least 51% of a given plant source, it can be labeled as that type of honey. For example, the highly prized Sourwood honey only has to be 51% Sourwood-based to carry the label “Sourwood honey.” Beekeepers who are state certified have their honey tested annually and it will carry a label of certification. A lot of the honey sold in grocery stores is highly filtered, pasteurized, or adulterated with non-honey sweeteners. Keep an eye out for local and “raw” honey instead, which generally has only undergone minimal filtration and retains its flavor and health benefits. The same is true for beeswax. “100% Beeswax” only means it is at least 51% beeswax- whereas “100% Pure Beeswax” would be 100% beeswax. The purest wax is from the cap wax not the comb wax. Royal jelly is produced from glands on the head of worker bees. All bee larvae are fed some royal jelly, but queen larvae are fed only royal jelly, which is what prompts that larva to develop into a queen. Royal jelly is sold for its reported health benefits. However, it is costly to harvest as it is only produced for feeding larvae and will result in the loss of the larvae it is taken from. The presenters shared booklets with honey recipes for participants to enjoy. Our presenters are active beekeepers with excellent local honey for sale. If you’d like to purchase honey from Ira Poston, contact him at Blueberry Hill Apiaries, phone number (336) 314-0499. If you’d like to purchase honey from Paul Jollay, you can look for it at the Burlington Farmers Market or contact him directly at the Glencoe Honey Company, phone number (336) 213-0912. Other local honey can be found at farmers’ markets or the Burlington Co-op Market. Many other local honey producers are members of the Alamance Beekeepers’ Association. This is the demo hive brought by the presenters. In the upper middle area you can see one bee with a yellow dot painted on it- this is the queen. Dot color indicates the year the queen was born so you can tell her age. A typical hive consists of a queen bee, drones, and worker bees. The queen bee is a female that mates with the male drones and produces all of the offspring in the colony. Worker bees are female but cannot reproduce- however, they make most of the decisions for the colony. There is only one queen and about 10% of the bees are drones- the rest are workers. This may vary during mating season or immediately prior to swarming. The bee colony propagates by swarming. When this occurs, new queens are raised and the old queen will leave the colony with a contingent of workers. Sometimes swarming results in multiple new colonies. The beekeepers does not always have control over where the swarm will land…a running joke amongst beekeepers is that they’re borrowing their neighbor’s bees. If a hive lacks a queen, or the queen is aging out, worker bees can cause larvae to mature into new queens by feeding them only royal jelly. The workers will do this only if the need for a queen is sensed or conditions are right to swarm. Otherwise the larva will become another worker bee. The queens are raised in special, larger brood cells than a normal bee, called queen cups. These flowers represent some of the varities that bees like in your garden. Paul told us his bees were following him around when he picked them for the program! Bees prefer to find nectar within a 1 mile radius of the hive. However, they will travel up to 3 miles if they find a source they like. Every hive has different preferences so every batch of honey is different! The first nectars of the year that bees use in this area are from redbud trees and red maples. They are also attracted to blackberry plants, privet, holly, poplar, and certain garden flowers such as zinnias. Bees are great to have around as pollinators to increase garden yield. Ever seen a strawberry that was lumpy and deformed on one side? That means that it wasn’t completely pollinated. Bees can help with that- and honey from strawberry plant nectar is great! Bees need a water source. They are attracted to the odor of the source, meaning chlorinated water sources are a draw as are stagnant buckets and puddles. If there are swimming pools nearby, be sure to provide a water source so they don’t bug your neighbors! Three pounds of bees represents about 10,000-11,000 individual bees. Bees keep warm by vibrating their wings. This means the only heat in a hive is that created around the ball of bees…they don’t actually heat the whole hive.